Republican Greg Gianforte alleged assault on UK Guardian reporter Ben Jacobs on Wednesday would appear to be utterly indefensible. There is little room for doubt about what happened in Montana: there were multiple eyewitnesses, and Gianforte was charged with assault that day. If Gianforte loses Thursday’s special election in Montana, he will deserve to lose it. At the same time, nothing justifies the mainstream media’s effort to blame President Donald Trump for what happened. And the media’s hypocrisy is evident in their failure to blame President Barack Obama when Democrats used violence in similar cases. The incident was captured on film, and the story was broken by Breitbart News. Etheridge went on to lose his congressional race to Republican Renée Elmers (who was unseated last year). There was also a similar (though less severe) report in Montana itself in 2012, when a local Democrat was accused of slapping the phone out of the hands of a reporter asking questions. Today, Trump’s critics are citing President Trump’s claim that the media are the “enemy of the people,” among other statements, to claim that he has implicitly condoned Gianforte allegedly did. 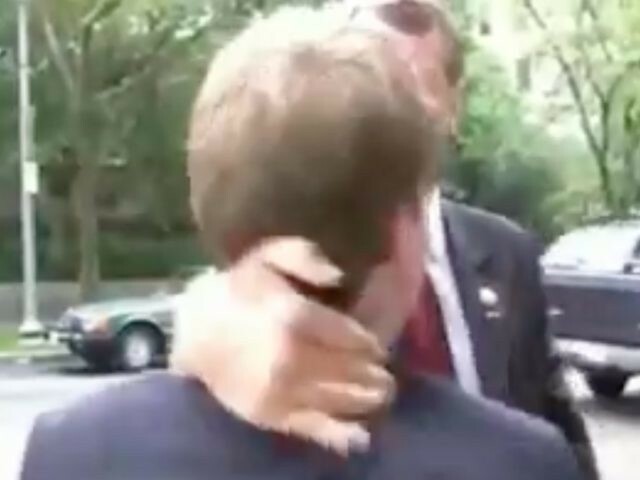 But when Andrew Breitbart pointed out that Obama’s deputy chief of staff, Jim Messina, had told Democrats in 2009 to “punch back twice as hard,” and connected that incendiary rhetoric to the beating of black vendor Kenneth Gladney by leftist thugs outside a Missouri town hall, the media were silent. They never tried blaming President Obama for Etheridge or any of the other incidents. It is not “whataboutism” to compare these cases, because all can — or should — agree that candidates physically attacking journalists is indefensible. But the media can and must be expected to apply a uniform standard to politicians from both parties. Instead, today, the media are showing their true partisan colors by using the Gianforte incident to impugn Trump — when they never did the same to Obama. The most ridiculous example was on CNN Wednesday night, when host Don Lemon badgered guest Paris Dennard, insisting that he blame Trump, snorting when he would not, and then attacking Dennard’s bona fides: “I can’t believe that you believe the words that are coming out of your mouth.” He cut Dennard off when he tried to reply. The double standard reveals that Trump’s critics are not concerned — at least, not primarily — about press freedom. Arguably, their effort to blame Trump for what happened in Montana, when they gave Barack “we bring a gun” Obama a perpetual pass, undermines efforts to convince the public to take attacks on journalists more seriously.